I have another No7 Christmas Moments #TaDah look to share today. The Day-to-Night Chic look is perfect for going to a party straight after work when you don’t have a lot of time on your hands to get ready. I created a healthy dewy base using No7 Stay Perfect Superlight Foundation and No7 Match Made Concealer. I then applied No7 Stay Perfect Shade & Define in Glistening Ray all over my lid. The formula is really creamy and the pigmentation is brilliant. I suggest going easy with this as you might end up to glittery, apply little by little and blend with your fingers – glitter shadow at its best! 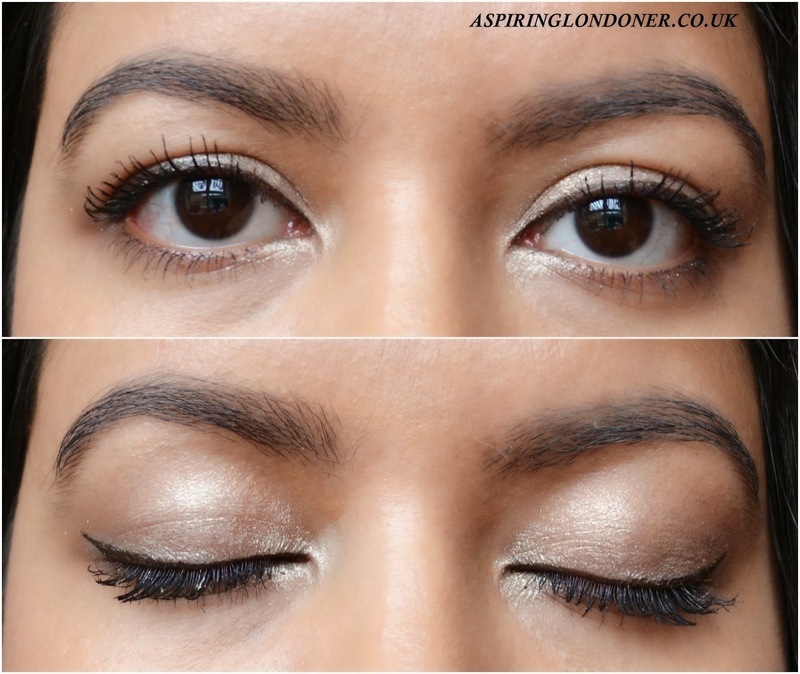 I lined my eyes with No7 Stay Precise Liquid Liner in Brown/Black to define my eyes and finished off my eye makeup with lashings of the No7 Lash Impact Mascara in Black. This mascara is just one of the best I’ve tried recently! For my cheeks, I used No7 Natural Blush Cream in Maple Silk. I apply the cream blush using my fingers, cutting down the use of blush brush and a little time! To add to my glowing base, I used the No7 Instant Radiance Bronzing Highlighter to the bridge of my nose, cupid’s bow, brow bone and the top of my cheek bones. To balance out my glittery defined eye makeup, I went for glossy yet subtle lips with No7 High Shine Lip Crayon in Statement. The lip crayon gives a super glossy finish and moisturises your lip with a hint of colour. This is the perfect product for taking you from day to night chic. On my nails, I went for a festive glitter colour with No7 Gel-Look Shine Nail colour in Golden Sands. This is my favourite look so far as it incorporates glitter for the festive season in such an underrated way. Hope you’ve enjoyed my version of the Day-to-Night Chic look! I previously created the No7 Evening Elegance look here, if you want to give it a try. You can see more details of the No7 Get The Look Makeup Inspirations here. Have you tried No7’s Christmas 2014 releases? What’s your go to party look? Share in the comments below or tweet me @aspiring_london!